When Holiday Inn Express unveiled the first four UK hotels with its new look rooms earlier this month (see news, January 5) they were missing one vital element that will, instead, debut in the US Holiday Inn Express chain this year: a special internal sliding door to cut noise from hotel corridors. Dubbed in the US as ‘the acoustic door’ since it takes advantage of the latest sound-proofing designs and technology, the sliding door separates the room’s entrance hallway from the bed/living area. After successful testing of the new door in 100 rooms spread across 15 US Holiday Inn Express hotels over the past year, the go-ahead has been given by Intercontinental Hotels Group (IHG) which controls the brand, for owners of individual properties to install the doors in new-build or renovated properties this year. 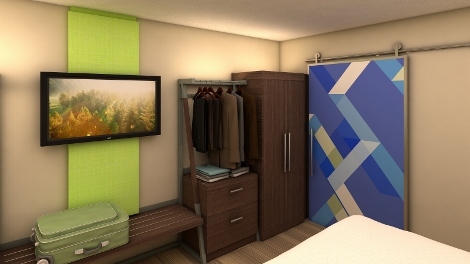 In the UK and Europe, however, IHG says there are no plans to install the ‘acoustic door’ door in new or renovated Holiday Inn Express rooms under design changes being carried out as part of its ‘Next Generation’ programme for the brand on this side of the Atlantic. But both the US and UK chains are tackling unwanted room-to-room sounds in their hotels with new “padded, noise-reducing headboards” for beds. 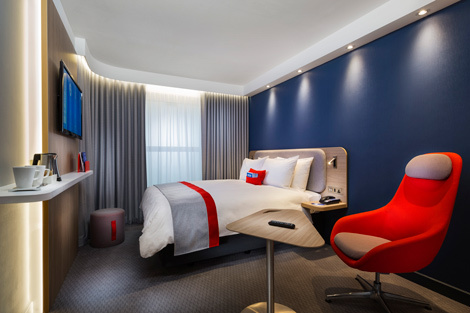 Noise, it seems, is moving right to the top of the ‘annoyance agenda’ for those who stay in hotels frequently, according to several surveys of travellers published over the past year including the prestigious J D Power annual Hotel Guest Satisfaction Survey. Everything from loud televisions in the next room, to banging doors and late-night revellers in the hallway can annoy guests trying to work or sleep in their rooms. That is in addition to noisy air-conditioning, bathroom plumbing, or the sound of lifts operating. But tackling the noise issue remains tricky, although the major global hotel chains are now starting to take the issue seriously. IHG, in particular, has recognised this and is developing and installing sound-proofing techniques not only at Holiday Inn Express but also across other chains in its 11-strong brand portfolio. Many of IHG’s Crowne Plaza hotels, for example, have introduced – as part of the chain’s Sleep Advantage programme – quiet zones between 9 pm and 10 am on five nights a week, essentially limiting housekeeping and any non-essential engineering work during those hours. Last autumn, moreover, the business-focused chain started to install new beds with curved headboards which it claims reduce noise levels by nearly a third. 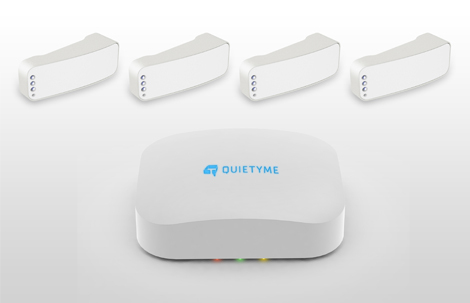 Some hotels in the US are also testing new technology, developed by a company called Quietyme, to monitor ambient noise levels in rooms. Sensors housed in a small unit in the room, similar to a wi-fi base, can not only detect an unexpected increase in noise but also temperature, light and humidity levels. The data can be sent either to the hotel front desk or to a mobile app, enabling hotel staff to take pro-active action about a potential noise or other issue before guests become irritated or annoyed. The jury is still out on this one. But a new chapter in the war on hotel noise was opened last year when a group of Dutch acoustics and sound insulation experts set up the Knowledge Centre Sound Insulation network (Kenniscentrum Geluidsisolatie or KGI in Dutch) to establish independent assessments of hotel noise. The network operates under the Quiet Hotel Room banner. KGI experts are hired by individual hotels to test specified rooms for airborne and impact sound and put them into three categories. Category one rooms are the quietest, allowing noise levels of up to 43 decibels, with category two up to 48 decibels and 54 decibels for category three (the noise level for a typical dishwasher). For every hotel room tested, so are the adjoining rooms. Not all rooms are tested in person as hoteliers can submit details of their own soundproofing measures to qualify for a certification in category 3. But all hotels that pass the tests can use the ‘Quiet Room’ certification in their marketing. In late December KGI held its initial Quiet Hotel Awards 2015 based on its evaluation of more than 100 European hotels over the past year. Overall winner was the five-star Hotel Regina in Paris, near the Louvre, with all its rooms certified as quiet rooms. Top city hotel was the four-star Swissotel Amsterdam on the busy Damrak canal, while the Hilton Paris Orly Airport received an ‘honourable mention’ for good test results in spite of being located close to one of France’s most popular airports. The Hotel Dux in the centre of Roermond in south-east Netherlands received the Design and Build Award for new-build hotel with the quietest rooms. Congratulations all round. But let’s hope it is the start of a quiet revolution in the ever-noisy hotel world. Analysis: Where are all the new hotel brands?